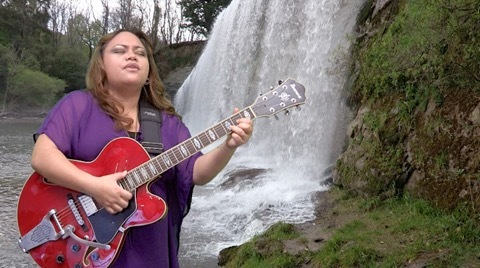 Gifted local musician Alyssha Maynard performs her original composition Broken Promises for the Amiri & Aroha music video. I am delighted that the awesome Alyssha Maynard has joined the Amiri & Aroha team, performing her original song Broken Promises for the soundtrack of Rere’s Children and for a music video to promote the Amiri & Aroha trilogy. Alyssha’s evocative song perfectly matches the tone and mood of Rere’s Children and adds an extra dimension to the film. We are very grateful that Alyssha was able to dedicate the time to our production in her busy schedule. Watch out for Alyssha, she is star of the future! 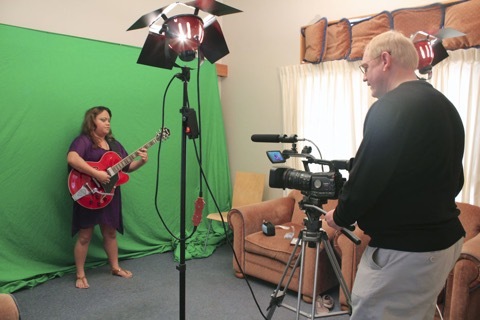 Filming Alyssha Maynard’s performance for the music video in our makeshift green screen studio at the Teal Motor Lodge.